Some people spend years studying Italian before they finally get around to speaking the language. 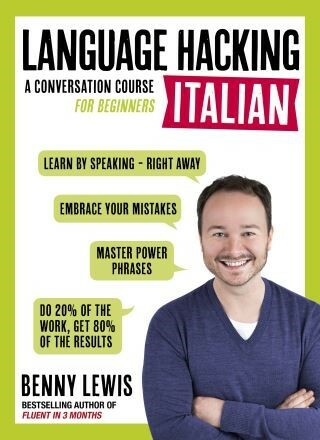 Unlike most traditional language courses that try to teach you the rules of Italian, #LanguageHacking shows you how to learn and speak Italian through proven memory techniques, unconventional shortcuts and conversation strategies perfected by one of the world's greatest language learners, Benny Lewis, aka the Irish Polyglot. It's not magic. It's not a language gene. It's not something only 'other people' can do. It's about being smart with how you learn, learning what's indispensable, skipping what's not, and using what you've learned to have real conversations in Italian from day one. H M commented on Language Hacking Italian from Language Hacking Italian: Hi Admin, I bought your hardback book, language hacking Italian, at a bookstore. Inside the book I find that the “course audio and extra resources” could be downloaded at “www.teachyourself.com/languagehacking”. But I couldn’t find the site to download the free material for my book. I ended up at your online bookstore and had to download this app with free Italian course which is almost 3 years old and without the extra material that the book with hardback promises! Thanks for your guidance.